Move over Ming Tsai. A Boston restaurateur is taking over the television screens. 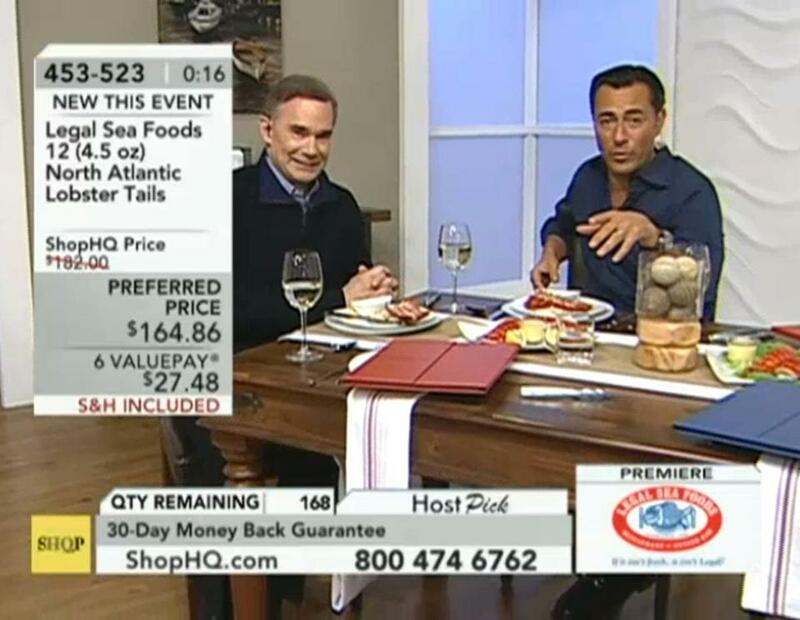 Late-night TV watchers might have seen Roger Berkowitz pitching his latest venture on a home shopping network this week: a dozen North Atlantic lobster tails for six installments of $27.48. That’s right, lobster tails, in six easy payments. The owner of Legal Sea Foods traveled to Eden Prairie, Minn., this week to appear live on ShopHQ (right), a shopping network on which he peddled filet mignon, Boston cream pies, crabcakes, and other frozen delicacies from his seafood business. Turns out he was quite the broadcast salesman. An hourlong show aired Monday, and a two-hour program ran Tuesday. He also told viewers they could have the exact same clam chowder that has been served at every presidential inaugural event since 1981. It could be shipped right to their door for five payments of $19.75. “We like to call it America’s chowder, if you will, because it is the quintessential clam chowder,” he said. He argued that ShopHQ isn’t “your mother’s home shopping network” and is more innovative than its competitors. The show, he said, presented the idea of shooting live from his restaurants in future segments. He also praised the host, chef and television personality Daniel Green. “I’m looking at it from the vantage point that we may get new customers from it and we have an opportunity to tell our story,” Berkowitz said. Mark Zuckerberg launched Facebook at Harvard University in 2004. Seven years later, the City of Cambridge finally joined the social network. Municipal governments can be slow to adopt new technologies — even those created right under their noses. State Senator Karen Spilka and Representative Ann-Margaret Ferrante are trying to reduce the lag time and put public agencies ahead of the curve with a new Innovative Communities Program that would connect city governments to local startups for pilot tests of promising inventions. Whether it’s a new traffic-management app or a robot that erases graffiti, Town Hall could be among the first places to find it, instead of one of the last. Spilka, an Ashland Democrat, said she plans to file a bill on Friday that would establish the program as a sort of matchmaking service between entrepreneurs and public officials. She and Ferrante, a Gloucester Democrat, cochair the Legislature’s Tech Hub Caucus and got the idea for the program at a policy pitch contest they held in November. They offered a real bill as the prize for the winning idea, which came from a team led by Cole Boskey, cofounder of Boston-based Wellable. Boskey’s company administers corporate wellness programs that combine popular health apps, wearable devices, and text messages. He complained that it’s too difficult for startups to contract with municipal governments and suggested a program that could streamline the process. Friday’s bill filing will be Spilka and Ferrante making good on their promise to put Boskey’s pitch into legislation. With fewer than 40 GOP members in the 160-seat House of Representatives, Democrats can usually push bills through with ease. But not always: At the end of the session, when state lawmakers meet informally, it takes just one person to block a bill from going forward. Right before Christmas, the Senate leadership whisked through a bill that would require health insurance plans to cover visits to educational psychologists. No debate. No roll call vote. The House leadership seemed equally receptive. Critics saw the handiwork of lobbyist Maryanne Lewis, a state rep-turned lobbyist back on her old home turf, promoting the bill for the Massachusetts School Psychologists Association. A number of well-known voices in the business community urged House Speaker Robert A. DeLeo to kill the legislation, complaining in a Dec. 30 letter that it would amount to yet another health care mandate after 20-plus following Romneycare’s passage in 2006. Those who sounded the alarm included Associated Industries of Massachusetts president Rick Lord,Retailers Association of Massachusetts president Jon Hurst, South Shore Chamber of Commerce president Peter Forman, and North Shore Chamber of Commerce president Robert Bradford. The state’s big health insurers also protested. Despite the formidable chorus of opponents, the bill was marked up and readied for passage in the House. Fortunately for the business groups, the Republicans listened. On Jan. 5, with fewer than 48 hours left in the two-year legislative session, Republicans George Peterson and Donald Wong blocked the bill. The parliamentary procedure earned a rare rebuke on the floor from Representative Angelo Scaccia, dean of the House. It may seem like the Republicans will always be in the minority on Beacon Hill. But this served as a potent reminder that, every once in awhile, the Republicans have just as much power as the Democrats who run the place. Can’t keep a secret? E-mail us at boldtypes@globe.com.